Everyone on Delta Airlines Inc.’s 11:30 a.m. flight from Los Angeles to the South by Southwest festival on Friday will get expedited security processing, complimentary cocktails and a chance to win first-class tickets to London and New York. Good luck booking a seat. This is an invitation-only junket to Austin, Texas, part of Delta’s bid to grab more of the entertainment industry’s travel business, which the carrier estimates is worth $1 billion a year. The handpicked high-fliers paid $247 each to rub shoulders and share armrests on a new Boeing Co. 737-900ER. Delta’s not identifying the passengers, but when it dispatched a special jetliner to the Sundance Film Festival in February, those on board included actors Kristen Wiig and Emile Hirsch. 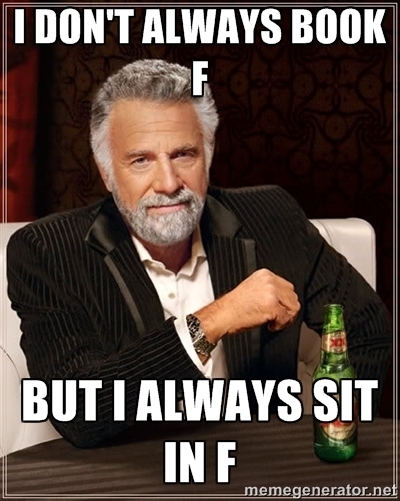 Who gets to sit in FC? If the goal was to impress, the 739 was a poor choice. Emile Hirsch is out of rehab already? Nice idea, but they're digging deep on the elite list if the invite goes to a recent MBA grad associate at a VC shop, who is quoted in the article. The real A listers are flying private. For SXSW they should have run it from SFO. Programs: Now just a lowly DL PM/1MM. This industry needs some competition. Agreed. I doubt the VIPs will be overly impressed with the 739. It's a miserable aircraft IMHO, and I'm a Boeing fan. Yeah should've used one of the VIP configured planes they use for other events like flying sports teams around. But if their goal was to pack in the most amount of people they can, then the 739 was an appropriate choice. How does one party on a 737-900? There isn't room for anything on that place except to sit still in your tight little seat. Delta thinks offering normal perks of first class to people who probably pay for first class everywhere will attract celebrities? More likely, Delta offers outstanding, over-the-top service in the hope that some people who book travel for others in the entertainment industry will be duped into thinking that is how everyone is treated every time. Put a few folks who get in front of the camera on the plane to increase hype. Is it possible that the A/C was not in normal service configuration but in some custom configuration (say for example, with all 75 D1 seating) for this particular service? excellent idea, props to Delta for going after some of the elite spenders in the industry. If they are flying for work have an assigned value, there usually is a rider in the contract that they get premium class. As an aside, no intelligent management agency would encourage more than a few of its clients to participate. There is a concept called risk management where valuable employees do not fly on the same plane or ride in the same vehicle. One doesn't want to lose the revenue stream if there is an unfortunate event. The 180 passengers will bypass most airport hassles on Friday, with special check-in and security lanes, and be treated to a pre-flight brunch by the restaurant Lemonade at Los Angeles International Airport. Everyone will receive a subscription to Spotify’s premium music streaming service and a gift from Columbia Sportswear. Amenity kits will be packed with several items, including from the skincare company Malin + Goetz. Wi-fi will be free on board. I'd say, "No," it's not possible. Looks like an ordinary 739. Granted, LAX-AUS is only three hours, but a 739 with 179 other passengers is a miserable way to spend three hours.